Let's fight!! Who doesn't like Tiramisu? Seriously, who doesn't? Tiramisu is one such incredible delicacy that everybody enjoys!! It's an amazing treat I have been doing for years now! As you might be aware, I like to get adventurous with blending ingredients! [A little too much, maybe!!] So, today, my take is on a Tiramisu Ice Cream! 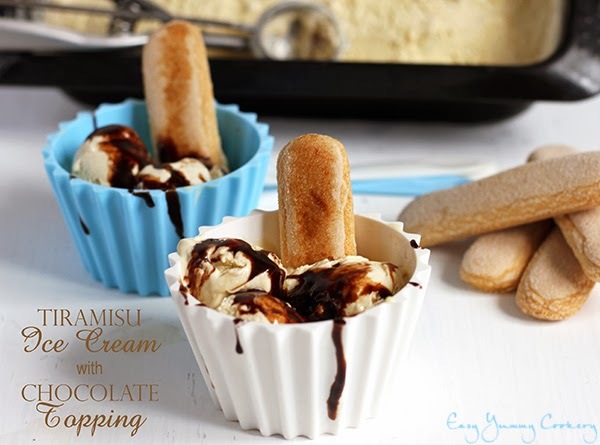 An easy recipe that will make you ask for more, this Tiramisu ice cream is one you'll keep doing again and again! Plus, if your mascarpone cream for Tiramisu goes runny, it's the perfect go-to recipe! The idea of making this ice cream actually came when one of my university friend told me that I am without any self-respect just because I would do nothing while he would insult me for never having tasted any of my treats!! Well, guess what!? He absolutely loved it, asking me to serve him twice! And it could have been more servings hadn't he been on the move! He liked it and requested that I make him ice cream every week!! Bottom line: Though it has a quite strong taste of coffee, the smoothness of the mascarpone cream makes it melt in your mouth! I totally recommend it! In a bowl, combine egg yolks and sugar together. Using your hand mixer beat until pale yellow and doubled in volume. Using a spatula, fold in the mascarpone cream into the beaten egg-sugar mixture. Set aside. While the milk is still hot, pour a little at a time into the egg-mascarpone mixture, while making you sure you beat it simultaneously, you might otherwise cook the eggs. Throw the mixture back into the pan, set over medium low heat. Using a wooden spoon, keep stirring so that the eggs do not cook, until the mixture coats the back of the spoon. Remove pan from the stove and transfer the mixture into a bowl. Let cool to room temperature making sure you occasionally stir the mixture so that a film does not form at the surface. Pop the bowl into the refrigerator and let cool overnight or for atleast 12 hours. It should be really cold. At the end of the wait, dissolve the coffee into the 2 tbsp of water. Churn your mascarpone custard together with the coffee in an ice cream maker and let set. Transfer everything into a container and let refrigerate for 2 hours atleast. And take it out 5 minutes before serving! Drizzle the Chocolate Nappage on top and with Boudoirs (rapidly soak them in or drizzle coffee on them)!